We are glad to announce the launch of BTC/EUR margin trading on CEX.IO. This is the third pair for trading with leverage on the exchange, after BTC/USD and ETH/BTC. 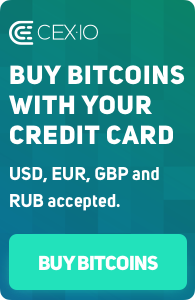 Please, note that EUR is the collateral currency for BTC/EUR pair. From now on, you are welcome to experience the advantages of margin trading for BTC/EUR and well, which allows to trade more than you’d be able to trade using your funds only. With CEX.IO, margin trading is easy even for beginners. There is no need to open any extra margin accounts and you are protected from negative balance due to special risk-preventing system. Funds borrowing is done automatically with position placement. To start trading, simply click on the Margin Trading tab on Trade Page and open a position. Margin trading on CEX.IO implies commission for position opening and rollover fee that is charged only for efficient time period, while position is opened. You can get more information about margin trading on CEX.IO here. Have a nice trading!